A day ahead of the 100th birth anniversary of the late Marshal of the Indian Air Force (MIAF), Arjan Singh DFC, the IAF on Sunday organised several functions across its bases to commemorate and mark the centenary celebration. Born on April 15, 1919, at Lyallpur, now in Pakistan, MIAF Arjan Singh DFC was the first and only “Five Star” rank officer of IAF. His dynamic personality, professional competence and honesty of purpose in his service to the IAF and the country sets him apart as a leader and an icon of the IAF. A seminar on Monday will be conducted at the Air Force Auditorium at Subroto Park in the national capital from 9.30 am. As a part of centenary celebrations of the Marshal, half marathons were planned at 100 IAF stations across where more than 10,000 air-warriors participated in the run. The Delhi leg of the half marathon took place from 5.30 am to 9.30 am at the Jawaharlal Nehru Stadium (JLN) Stadium for the air warriors located in Delhi & NCR. More than 800 air warriors participated in the event. Air Marshal Raghunath Nambiar, AOC-in-C, WAC was the Chief Guest for the flagging off ceremony and Air Chief Marshal BS Dhanoa, Chief of the Air Staff was the Chief Guest during the closing ceremony and prize distribution. IAF’s Jorhat station had organised the run of 21 km named as ‘Centenary Run’. The race was flagged by Air Commodore SK Verma VSM, Air Officer Commanding, Air Force Station Jorhat. A total of 135 air warriors of the station participated enthusiastically in the ‘Centenary Run’. The run was conducted to propagate the accomplishments and to pay rich tribute to the legendary Marshal of the IAF amongst all Air Force personnel. All the air warriors took a pledge to leave no stone unturned to carry on with the legacy of the Marshal of the Indian Air Force, Arjan Singh DFC for the glory of IAF. The IAF legend had always been an inspiration to air warriors leading from the front not only in the war front but also in the field of sports. He was a sports achiever. His passion for hockey was unparalleled. As an ace swimmer, he held an all-India record in freestyle swimming in one mile and half mile events. He was the vice-captain of swimming, athletics and hockey teams during his training at RAF College Cranwell. In 1939, the No. 01 Squadron, RIAF was deployed at Miranshah in the North-West Frontier Province in the counter-insurgency campaign. Flying in this region was fraught with danger; the tribesman regularly fired at the slow-moving Wapiti & Audax aircraft, sometimes even bring them down. On one occasion, he, then a young Flying Officer, was brought down while flying the Audax. His gunner, Ghulam Ali, who was disorientated, got out of the aircraft and ran towards a hillock where the tribesmen had taken position and started firing. MIAF Arjan Singh was injured in the crash and blood was streaming down his face, but when he saw Ghulam Ali, who was running towards the tribesmen, he broke into a sprint to guide him into safety without concern to his own life and thus saved his life. On August 15, 1947, MIAF Arjan Singh had the unique honour of leading the fly-past of over 100 IAF aircraft over the Red Fort and on the same day, assumed the command of Air Force Station, Ambala in the rank of Group Captain. The MIAF was awarded the Distinguished Flying Cross (DFC) in 1944, for displaying outstanding leadership, great skill and courage in the Burma Campaign during World War II. 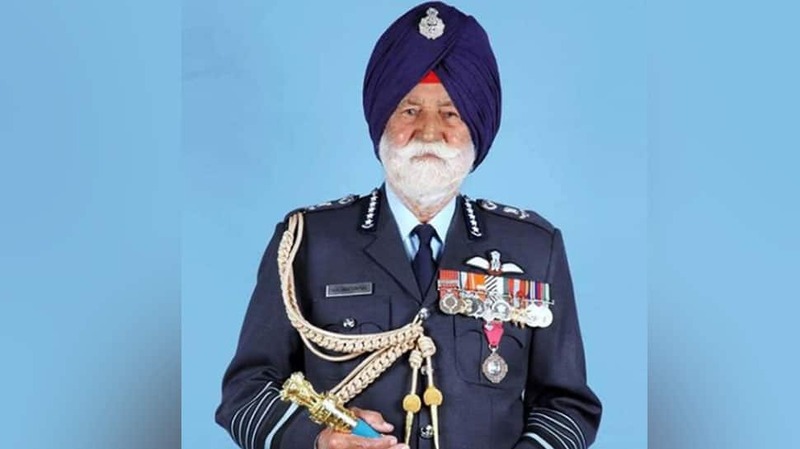 In November 1965, Air Chief Marshal (Later Marshal of the Indian Air Force) Arjan Singh became the first Air-Warrior of IAF to be awarded the Padma Vibhushan. He received the award from the then President Sarvepalli Radhakrishnan. On January 15, 1966, the MIAF was promoted to the rank of Air Chief Marshal and he became the first Air Chief Marshal of the IAF. On January 26, 2002, the MIAF was promoted to the rank of Marshal of the IAF by KR Narayanan, the then President at a special Investiture Ceremony at Rashtrapati Bhawan, New Delhi.